Commercial construction projects tend to move at a fast pace out of necessity. Any delays in construction can be disastrous and oftentimes there’s very little leeway for delays or schedule changes. That’s why it’s crucial to know what causes construction delays and how to avoid them. Here are some of the most common things that derail construction. Keeping a construction project on schedule to meet the completion deadline is not an easy task. One of the most important considerations in hitting the defined deadline is ensuring the original schedule is well thought out and realistic. The schedule needs to consider every detail and scope of work, timelines from every subcontractor, and lead times for every order. A master schedule should be used to guide the project and updated frequently. As with any type of construction project, commercial construction often calls for materials and supplies that simply have a long lead time. Furthermore, a lot of products have a fixed lead time, i.e., there is no option for expedited shipping no matter how much you’re willing to pay. HVAC units are a perfect example; often manufacturers don’t keep a lot of units in stock. Also, any specialty or custom items are likely to have an extended lead time. One potential concern for delay that is often overlooked is the weather. Quite a bit of work can be done despite a little rain, but mother nature has a strong will. Severe weather such as lightening, tornadoes, hail, etc. may inhibit progress, especially on exteriors. It’s imperative to plan sufficiently for permitting and inspection timelines. Local governments and municipalities may differ from one to the next and often there is no fast-tracking permits or reviews. It’s important to ensure that the project plan accounts for potential delays in permitting and inspections so that the overall project isn’t thrown completely off course by a change that is in large part uncontrollable. Ultimately avoiding delays in your project boils down to planning and scheduling. Work with your project manager to ensure the schedule is realistic and stays on track throughout the course of the project. Make sure to account for long lead times in the initial schedule. Place orders early and think about specialty items. Lastly, be sure to evaluate and adjust as frequently as needed. With careful planning from the beginning, experience contractors like Green Heart Enterprises can get your next project completed on time and within budget. Contact us today to tell us more about your project. There are many phrases used in modern construction such as renovation, remodel and retrofit that have similar meaning and may be used interchangeably. However, these types of projects do have unique specific meanings and unique considerations. It’s important for you to know the difference so that you’re able to clearly communicate with commercial general contractors. Renovations are projects wherein the structure is being restored or repaired. Renovations are somewhat synonymous with remodeling, however the goal of a remodel is to change the structure, while the goal of a renovation is to repair the structure. Some renovations are subtle, hyper focused on a specific element, and some renovations are more substantial and overlap with remodels. A commercial renovation often includes repairing or replacing any part of a building that may be outdated or damaged. It is fairly common to see renovations to address structures or specific elements that may not meet modern building codes. Renovations are often more cost effective than new construction or a complete remodel, and typically, renovations also add value to the structure or building. Another type of project similar to remodeling is retrofitting. With this type of project, you are adding something new to the original building or structure, however the goal of a retrofit is to specifically improve the functionality of the building by adding new technology, building systems, or equipment. Conversely, remodeling tends to be more focused on the aesthetics and appearance rather than purely functionality. One of the most common retrofit projects for commercial buildings today is making a building more efficient through updated heating elements, improved windows, or new insulation. Rooftop retrofits for commercial buildings may improve the life expectancy of a structures roof and offer lower-maintenance. Seismic retrofitting projects improve a structures ability to handle earthquakes or ground motion. As long as there is new technology to improve commercial buildings, the retrofit opportunities will continue to grow. New construction projects are very straightforward: constructing a new building or structure from the ground up. This type of project, although simple in terms of definition, is very unique from one project to the next. Most often a new construction project requires working with architects, builders, construction teams and general contractors at a minimum. Building from scratch may be a more expensive option than renovating but oftentimes a new build is the best option for your specific project. New construction allows for application of modern technology throughout the building for everything from electrical to sustainability considerations. New builds also often mean lower maintenance costs over time. Ultimately type of project you will depend on the purpose of the building, your budget, and the goals of the project. Once you have clarity on the project as a whole it’s easy to decide if a renovation, new construction or even a retrofit is right for your commercial construction project. If you’d like to learn more about our experience in everything from retrofits to renovations contact us today. The way consumers shop and purchase products has continued to evolve over the last few decades. With the rise of ecommerce and online shopping efficiencies, brick-and-mortar stores now have to put the consumer experience first. Retailers are working hard to keep up with this evolution and looking to new and exciting construction options to help. Consumers are sharing more experiences on social media today than ever before. Everything from a mundane trip to the grocer or doctor, to a big night out at a five star restaurant. As a result of this trend, retailers are looking to create dedicated spaces for social media sharing within their store. Retailers may build a unique sitting area or include unique signage or wall construction, anything that may make for a share-worthy photo. Many retailers are also relying on general contractors to build in wi-fi technology to improve the consumer experience in-store. Offering high speed internet in store allows consumers to browse products and price shop, search for coupons, and of course, share their shopping activity publicly via social media. Furthermore, many retailers want networking abilities so associates can carry tablets and mobile devices to help customers find items or check out with a non-stationary POS system. In recent years the big trend in retail has been building open-air, mixed-use developments that offer shopping and restaurants in addition to multi-family housing. These “lifestyle” retail centers also often include green spaces, benches and picnic tables, and connected pathways throughout. This trend will not only continue in. 2019, but will continue to evolve as retailers further embrace the open-air concept and integrate natural elements into their construction. Most consumers are not fans of harsh fluorescent lights, little to no natural light, and tight and cluttered shopping aisles. For these reasons retailers are moving to incorporate a more natural vibe through the use of skylights, UV bulbs, and even plants and water elements in-store. This not only helps create a relaxing atmosphere, but can also provide another share-worthy photo opp in-store. Another trend in retail construction is renovations – rather than seeking new construction, retailers are looking for older buildings that may or may not have been retail facilities originally. These buildings represent a great opportunity to modernize and streamline in an efficient and sustainable manner. The unique construction elements that old or even historic buildings have to offer can truly set retailers apart from the bare-bones, functional interiors of new construction. Today’s consumers want a more engaging experience and that starts with the construction phase for retailers. As the retail landscape continues to evolve, new and exciting opportunities for retailers and general contractors will continue to grow. If you’d like to learn more about our experience in the retail vertical or what we can do for your next project contact us today. In a recent Consensus Construction Forecast, the American Institute of Architects (AIA) has predicted nonresidential construction industry spending will increase in 2019 and continue to grow in the coming years. With the increased levels of construction activity, we expect to see trends emerge that will shape projects across a range of industries and sectors. As we have written about already this year, improving sustainability on commercial construction projects is a trend that we’ve seen throughout 2018. We expect this movement towards methodologies and processes focused on reducing waste and energy consumption to only grow in the years to come. Everything from material selection, to construction waste management is being evaluated and commercial contractors will continue to look for efficiencies that will ultimately protect the planet’s valuable and limited resources. As the commercial construction industry has shown steady growth throughout 2018, the following key sectors have stood out: office buildings, retail and restaurants. Because consumer spending has been on the rise we are especially seeing a correlation in retail and restaurant construction especially. Many national restaurant chains are opting for new construction rather than retrofitting existing spaces; and in cities across the nation the spike in “live, work, play” developments has also contributed to the rise in retail and restaurant construction. With increased construction activity we will continue to see a labor shortage in the industry. Many subcontractors are already working at full capacity, meaning they are in a position to be more selective about the jobs they take on. They are also in a position to drive pricing for their labor on certain jobs, especially those that may require overtime work or off hours labor. This trend is on pace to continue into the new year as commercial construction continues to grow. Building Information Modeling (BIM) is used to virtually simulate a project before construction begins, increasing visibility into fine details for everyone on the team and creating time and cost efficiencies long term. The technology creates virtual models, allowing the team to easily collaborate, share information and identify possible design challenges. Strong communication and collaboration are key to any successful construction project and BIM improves both. There are countless moving parts in commercial construction, and as we move into a new year we’re excited to see where the industry is headed. With improving economic conditions and a continued increase in consumer consumer spending, 2019 is expected to be another great year for growth in the commercial construction industry. Sustainability is defined as the desire to perform activities without any depletion of resources or bringing harmful effects on the environment. Sustainability practices have increasingly moved to the forefront for businesses, with companies of all sizes and across industries placing emphasis on lowering its environmental impacts. The construction industry is no different. Today more than ever construction companies and general contractors are changing their techniques and materials acquisition throughout the construction process to reduce waste, energy consumption and various inefficiencies at building sites. Looking ahead to 2019 and beyond, here are some of the ways we can work to further the focus on sustainability in construction. Material selection is one of the easiest ways for general contractors to improve the environmental impact of a project. Selecting materials that are manufactured from recycled products and local sources can drastically improve sustainability on a project. LEED points are awarded based on material selection and are even based on the long-term efficiency of appliances and fixtures. For example, water use reduction has become a major issue and is something that can be easily addressed by selecting automatic faucets and toilets. The use of prefabricated materials, or materials that are pre-cut in a controlled environment, decrease waste and lead to stronger end products. For this reason, selecting prefabricated materials has become a key strategy for saving time and increasing the sustainability of a project. For example, using BIM software to pre-cut sheet metal in a controlled environment will avoid shape-changing issues potentially caused by hot or cold temperatures. Through the use of pre-fab materials we see improved quality of buildings, with less waste. Historically, the construction industry has approached construction waste with a simple process: use and dispose. Building an effective waste management process is a key element in reducing the industry’s waste issue. The evolving process is focused on two key components: sustainability and cost efficiency. To address these considerations, contractors need to develop site waste management plans, choose environmentally friendly haulers, explore offsite construction options, prepare refurbishment audits, and develop internal communication strategies. With the sustainability of the industry under scrutiny, contractors are facing more pressure than ever to build sustainable waste management plans into every project. At Green Heart, we believe that it is important to protect our planet’s valuable and limited resources. The transformation happening today in the construction industry is amazing, and Green Heart Enterprises is excited to be a part of that evolution. As traffic continues to increase for major airports, upgrades to the infrastructure are becoming a necessity. Upkeep and renovations for terminals, gates and airport facilities are needed to accommodate airports like Hartsfield-Jackson and others that are among the busiest in the world. Airlines and airports alike are looking to improve efficiency, flexibility, scalability, and ultimately the consumer experience for travelers. Even though every airport is different and the specific needs of air carriers may differ from location to location, there are specific trends that have stood out this year. In the past year alone there has been a remarkable integration of technology in the commercial construction space. Everything from BIM (Building Information Modeling) to employee tracking software to AR/VR technology is now being used on construction projects. Drones are even being used to monitor job site conditions and evaluate safety hazards. Evolving technology can enhance job site efficiency, protect employees, and even improve collaboration among project stakeholders. Most commercial construction projects today strive to incorporate sustainability in some manner to reduce waste and ultimately improve profitability. One of the more common methods of improving sustainability on a project is through the use pre-fab materials. This decreases waste significantly while also improving the quality of the construction material. Contractors and builders are also leveraging construction waste management, seeking LEED certified building materials or recycled materials, and even focusing on the efficiency of transportation fleets. We’ve discussed the variety of project delivery methods before, and while there are many options today the traditional “design, bid, build” approach just doesn’t make sense in the modern industry. Collaborative project deliverability approaches like Design Build and Construction Manager are on the rise, and for good reason. Increased involvement from key parties throughout a project will oftentimes lead to a better end result: a project completed on time and within budget. Looking ahead we can expect to see these trends continue to play a major role in the evolving commercial building industry To discover how your business can work with Green Heart Enterprises and benefit from these trends contact us today. In today’s modern business world there is a sense of urgency with almost everything, including commercial construction projects. Everyone from the building owner to the subcontractor is asked to deliver projects on a denser schedule than ever before. For many of our clients, from aviation and healthcare to retail and education, project timelines impact the bottom line. Any sort of delay can potentially be disastrous; which is why it’s important to understand common project delays and how to avoid them. One of the easiest and most straightforward ways to ensure your project deadlines are met is to hire an expert commercial construction project manager. Not only that, bring this party in as early as possible. When the commercial construction project manager is involved early in the design phase, that expert can provide input on a realistic timeline for all parties involved. Clear and regular communication on the job site is arguably one of the most important factors in getting your project done on time. It’s the responsibility of the commercial construction project manager to communicate everything that may impact schedule to the various parties, from the property owner to the subcontractors and tenants, etc. Everyone involved in the project should know when key activities are scheduled. Contractors and subcontractors should be transparent about any concerns or potential delays in work as they arise. Oftentimes certain materials simply have a long lead time on order and delivery. That lead time is often fixed, meaning there’s no wiggle room or expediting options. For example, specialty appliances or custom windows / doors often take longer than standard materials because they are built to spec. It’s important to order these types of materials in a timely manner and ensure that the extended lead times are accounted for in the construction schedule. As an expert commercial general contractor, Green Heart Enterprises understands the common challenges and typical project delays. That’s why we’re always working efficiently to ensure we complete projects on time. When we have a plan, transparent communication, and understand client expectations we’re in the best position possible to complete the project on time. If you would like to more information on our process and how we can help with your next project, contact us today. Construction Project Delivery Methods: Which Is Right for You? Choosing the right project delivery method is one of the most important decisions that will be made by an owner or tenant starting a construction project. The appropriate delivery method for your project can reduce risk and improve the likelihood of meeting project cost, quality, and schedule goals. Each of the different project delivery methods has advantages and disadvantages for both parties, however the delivery method really depends on the needs of the project. Design-Bid-Build is very linear and typically starts with design services, often an architect, creating renderings, drawings and plans. All design and specification details are defined in this initial step. Second, General Contractors bid on the drawings and define the cost of the work, before building out the project. There is no collaboration between the design and construction teams. From there, the selected General Contractor moves onto the third step to execute on exactly what is detailed in the construction documents. The Design-Bid-Build method is well understood and consists of clearly defined roles for each party. The Design Build project delivery method involves hiring a single team to execute on an entire construction project including design services and construction services, from preconstruction to completion. Many steps in this delivery method can run concurrently. This method lends itself to better collaboration between the design and construction processes. It is ideal for projects on a tight schedule, and often there are few pricing changes throughout the project and open communication. With everything funneling though the general contractor, not only does the client have a single point of contact, but it also eliminates liabilities and potential issues caused by two separate design and construction contracts. With the Construction Management project delivery method, there is a single direct contract with a construction manager that is brought on early in the planning and design process. That construction manager will then subcontract out general contractors to execute on the project. This method also allows for concurrent design and construction work, however there is an increased risk of communication issues and budget concerns due to the structure of the contracts and subcontractors. The best project delivery method depends on the needs and priorities of your project. If you would like to more information on which is the most appropriate method for your project contact us today. Our team offers unparalleled expertise in commercial construction and renovation. If you only have experience working with residential construction or residential general contractors, you may not realize how different a commercial project can be. Most residential general contractors don’t foray into commercial projects and most commercial construction companies don’t work on residential projects. The process can be quite different depending on the type of project and the construction required. Residential general contractors, whether new home or remodeling, are typically working with smaller structures than commercial construction. That means projects are cheaper in terms of material, labor and overall cost; obtaining material selections can also be somewhat difficult. There is also a personal component to residential construction as contractors are often dealing with homeowners. Commercial buildings, on the other hand, differ in terms of scale, complexity and functionality. Most commercial buildings have greater infrastructure needs as well as different regulations and protocols. They are often more time-driven than residential projects as well. Commercial projects often require additional support from architects, engineers, designers, and building committees; and a commercial general contractor is prepared to work with the additional decision-makers based on experience. Arguably the single biggest difference is the code requirements for commercial buildings such as handicap accessibility, egress requirements, fire safety, etc. With residential construction, many of these code requirements are not quite as stringent. Most commercial buildings require sprinklers and fireproofing, which leads to complicated electrical and plumbing requirements, where residential construction does not. Whether you are looking for help with a commercial or residential construction project, hiring the appropriate general contractor is of the utmost importance. A commercial space is used in an entirely different manner than a residential space which is why there are so many differences. You need a general contractor who is familiar with commercial plumbing, electrical, egress, roofing, even commercial finishes. You need a general contractor who is experienced in projects of similar scale, complexity and functionality. If you would like to learn more about our expertise in commercial construction and renovation don’t hesitate to contact us! Natural light is especially beneficial in commercial buildings because not only can it help reduce energy consumption, it can also improve working conditions and positively impact productivity of building occupants. Unfortunately, there are inherent challenges when it comes to ensuring a commercial building has sufficient natural light. So, how can you incorporate more natural light in your next commercial renovation or constriction project? The ability of daylight to positively impact employee wellbeing and productivity has been a hot topic as of late. Kevin Van Den Wymelenberg of Architectural Lighting explains that daylighting workspaces increases comfort and productivity of workers by providing the visual and mental stimulation that regulates circadian rhythms. Additionally, natural lighting can lead to lower energy costs resulting from reductions in electricity consumption. The Whole Building Design Guide explains that electric lighting accounts for up to 50% of total energy consumption in commercial buildings, and daylighting can reduce as much as one-third of total building energy costs. Incorporating windows and skylights is the first option for introducing natural light into commercial buildings. However, proper placement is key for the windows and skylights to be effective, which is where the expertise of your general contractor is invaluable. The type of windows and placement of these should be influenced by the amount of light needed, the type of workspace intended, privacy requirements, and the overall design of the building. Oftentimes simple windows or skylights are not enough to bring natural light to the interiors of commercial buildings. Another popular tactic for leveraging natural light is to use light colors and reflective materials throughout a building. For example, white walls, ceilings and panels will reflect natural light and increase overall brightness of the workspace. Glass-partitioned walls and doors are also great for reflecting light and creating a sense of openness in a work environment. Is There Such a Thing as Too Many Windows? Most people would agree that there is no such thing as too many windows, especially in a commercial building. However, it is important to keep in mind certain challenges associated with numerous windows. Traditional glass simply does not control heat or glare, which can lead to discomfort for building occupants as well as have a negative impact on energy-efficiency goals. With this in mind, it’s important consider glass and window coverings. Thinking beyond bulky shades and blinds, dynamic glass or tinted windows is a great option allow building occupants to benefit from natural light without the drawbacks. Leveraging natural light to create a comfortable, healthy environment and beautiful space for building occupants is possible. It all starts with a strong partnership with your commercial general contractor to plan for the best lighting solutions. We would love to learn more about your construction or renovation project. Contact us today! When it comes to LEED certified green building projects contractors play a huge role in contributing to the success (or failure) of the project. LEED, or Leadership in Energy and Environmental Design, is a green building rating system that may be applied to a variety of projects from building, to community and home projects. LEED is intended to offer a framework for efficiency and earning a project certification requires a sustained effort by everyone on the team, including contractors and subcontractors. To achieve a LEED certification, commercial construction projects must satisfy all LEED requirements and earn at least 40 out of the 110 points on a LEED rating system scale. Oftentimes the design requirements for LEED projects go above and beyond standard requirements and common building codes. It is imperative that the project has a strong design or construction team that has a robust knowledge of the LEED rating system. To that end, oftentimes a LEED coordinator will be involved with the project. The LEED coordinator will ensure a project meets the design intent and LEED goals for the project. Initially, all of the LEED design and construction requirements should be detailed by the design team in the drawing and specification construction documents. Using those documents as a foundation, the LEED coordinator should be responsible for ensuring contractors and subcontractors on the project understand the LEED measures and requirements included. The construction phase represents the most significant contribution to LEED certification on the part of the contractor. As decisions are made in regards to building materials, installation, budget and scheduling the impact on LEED credits will be considered. The general contractor and any subcontractors or laborers involved in the project should be trained in the basics of the LEED framework for efficiency and long-term cost-savings. These primary consideration points include erosion and sedimentation control, pollution prevention, waste management, and so forth. In addition to these job-site quality considerations, ongoing monitoring and documentation of progress to LEED goals is important throughout the project. LEED projects are document intensive, which is why typically the onsite LEED coordinator will complete intermittent inspections and reports to collect any material LEED documentation, collect photos, and monitor progress towards the targeted LEED credits. These inspection reports are the primary form of communication to contractors detailing any maintenance, updates or even corrective measures needed. Subcontractors are often pre-qualified in LEED project experience and in-depth questions and background checks are typically part of the hiring process for a project. However, it’s important to note that the primary general contractor on any project is also responsible for gathering and submitting relevant LEED certificate and credit information from any subcontractors. Furthermore, LEED is an educational process in many ways, and the General Contractor should provide a continuous feedback for subcontractors on exactly what the LEED requirements are for the project. It is equally as important to provide ongoing commentary on what subcontractors are not supposed to do or what they are to avoid doing on the project. Whether it’s construction, marketing, or even launching a new business, planning is the foundation for all successful projects. The design phase, or pre-construction phase, for commercial construction is especially important because you want to ensure that every decision being made will maximize your investment. With a creative partner you can trust, this pre-construction phase will help set your project up for success. Kicking off a project with an appropriate budget, an accurate schedule, and a clearly defined design plan is crucial to the success of any commercial construction project. This process helps ensure that your designs are translated efficiently into an amazing final product. Planning: Successful projects begin with diligent planning. The design process starts with an initial meeting to discuss the vision, logistics, and final project outcomes with the key decision makers and the creative experts on the commercial general contractor team. This should be a collaborative process that explores options and directions that ultimately lead to an amazing finished product. Together, the team will walk through architectural, physical and economic requirements of the project as well as code requirements. Design Development: Design development then kicks off with experienced design professionals creating architectural, structural, and engineering drawings, as needed. These designs should detail specifications of the project from the ground up, oftentimes with artist renderings. The designs should also include detailed descriptions and mockups. Financials: Financial models and budgeting should also be a key component in the pre-construction and design phase. Conceptual estimates are often created throughout the pre-construction phase and as a design is refined realistic cost estimates are updated. Any subcontractors and suppliers should provide construction cost estimates, logistics details, and schedules. Permits: Permitting is another important step that your commercial general contractors should handle on your behalf. It’s important to ensure all appropriate permits are obtained not only to protect property value and guarantee code compliance, but also to save you money in the long run. An integrated and collaborative approach to design phase pre-construction services will ensure your project is a truly exceptional experience, from preconstruction to project completion. That’s what makes for great results. Commercial general contractors expect a vetting and discovery process before signing any new projects. You need to gather as much information as possible to make an informed decision. But beyond the basic company history and project history, what do you need to know? Below is our list of critical questions to ask any commercial general contractor before narrowing down your search. What similar projects have you worked on? You want to know not only what experience they have with similar construction and/or remodeling, but also if those projects were successful. You should ask if they were completed on time and within budget. What level of insurance coverage do you currently carry? Of course, the commercial general contractor you choose needs to be bonded & insured. However, it’s important to take that one step further and ensure they have enough insurance to cover the needs of the job. Some contractors could be under-insured and cause more damage than they are insured for. Do you have site supervisors? You want to be sure you will have main point of contact on site that is employed by the commercial general contractor you hire. What do you rely on subcontractors for? Most commercial general contractor companies do use subcontractors so it’s important to find out up front what exactly they use them for and what capabilities they have in-house. Typically, you don’t want a management only firm that has. Is there any type of guarantee around project deadlines? What you really want to know is how often projects are completed on time. Oftentimes a commercial general contractor will build in guarantees and/or potential penalties if the project runs over the allotted timeframe for specific reasons. The important component to this question is to get any guarantees or penalties in writing in the final contract. It’s important to be frank when talking about money, especially early in the process. These details matter and knowing when payments are due, what the payment terms are, and how much everything will cost ensures everyone is on the same page from the beginning. What’s the likelihood of having change orders after the scope of work is defined? Oftentimes change orders are necessary; there can be unforeseen circumstances with just about any project. But it can be helpful to get an idea of how often this happens and what the likelihood is for your specific project. As an extension of that, you should also ask what the process is for possible change orders. How will these be communicated and handled? On average, how many projects do you work on concurrently? You want to get an idea of how busy or spread thin the commercial general contractor ,may be during the course of your project. This ties back to timeliness and the likelihood the project will be complete on time. Last but certainly not least, always ask for references and take the time to follow up on them. By checking references, you can not only get an idea of the variety of work the commercial contractor does, but also the quality of work. What is the first step to hiring a commercial general contractor? Typing “commercial contractors” into Google will return a number of options, but how do you narrow that list down and qualify each contractor? It’s important to find the right contractor for your project. Before discussing how to select a commercial general contractor, it’s important to understand what one is exactly. A commercial general contractor works to complete commercial construction projects, as opposed to residential. It is typically a business entity, rather than an individual, and they are responsible for planning the construction from beginning to end. They are typically selected through a bidding process where the lowest bid from the most reputable company is awarded the project. What is the desired schedule for the project? A well-defined plan sets the tone for success, so it’s important to have the scope and goals of your project well defined. Once that’s complete, the next step is to send the project out for bid and request proposals or estimates from qualified, licensed commercial contractors. The contractors will review your project to create their bid, which is a project plan that details timelines and estimated costs. Upon reviewing bids it’s important to ensure that each bid includes all of the requested components and details anything that is excluded. Also, look for “Add Alternates” and/or “Upgrades” when it comes to materials, as these are potential causes for increased cost. When narrowing down the list of bids you should take into consideration pricing, communication processes, level of detail, quality of work, proposed timeline, and company reputation. You should not choose your commercial general contractor based solely on price. Communication is paramount for a successful construction project and you want to select a general contractor that will be clear and transparent every step of the way. You should also evaluate the payment terms to ensure there is a schedule of values and associated costs detailed in conjunction with the timeline. A progressive payment schedule allows you to make payments as certain milestones are completed. Lastly, in addition to the timeline, there should be a completion date or substantial completion date that is clearly stated in the contract. Be sure to start early. This can be a time consuming and taxing process and you do not want to make the wrong selection based on timeline constraints alone. Pay attention to word of mouth referrals. Oftentimes a referral can tell you more about the quality of work than anything else. Also, ask for references and check them. If the general contractor does great work they will be more than happy to provide referrals from previous, happy clients. You can also get information about companies in your area from trade groups like the Associated Builders and Contractors, Inc. or The Associated General Contractors of America. The ultimate goal for any commercial construction project is to find a reputable company that provides quality work, in the defined timeline. Remember, the company you choose for your commercial general contractor will be your business partner, so choose the company that is a fit for your project and has the qualities you’re looking for. Whether you’re researching for a new project or looking to get into the construction field, understanding the ins and outs of all potential roles can get complicated. Construction projects don’t just get designed and built overnight, and sometimes there can be hundreds of people involved that bring a construction project to life. The lines between General Contractor and Construction Manager can seem especially blurry because both are involved in coordinating a construction project, and sometimes a General Contractor can also serve as a Construction Manager. Even though that can be some overlap, we’ll break down the difference in each role so you can be prepared and fully understand if you’re looking for a General Contractor or Construction Manager. The key difference between a General Contractor (GC) and a Construction Manager (CM) is that a GC will be a business entity, and a CM will be an individual. GCs are going to be hired as a 3rd party through a bidding process to manage the construction of a predetermined design, while a CM will work on behalf of the company owner and be hired based on qualifications to work on a project from design to completion. While both are important to a successful construction project, it’s easiest to understand the differentiations by taking a look at each role. What is a General Contractor (GC)? A GC will be hired on to a project through a bidding process, where generally the lowest bid from the most reputable, trusted company would win the project. The GC will be working to complete a project within the projected bid, but if the project costs go over the estimate the company owner that hired the GC is completely responsible. This is why it’s vital to work with a trusted GC that you know will give you an honest estimate and work to stay within budget and time constraints. Conversely, if a project is completed ahead of schedule and under budget, the GC will generate a profit from the project, creating an atmosphere where both the GC and project owner need to have competitive pricing to work together. While a GC isn’t involved in the pre-design process, they are still responsible for planning the project construction from beginning to completion. The General Contractor will approve and hire any necessary subcontractors or additional personnel required for the project, which is why a GC is typically a business entity and not an individual person. A full General Contracting company will have an entire network of specialists and subcontractors required to complete a construction project, and will work to ensure the right people are placed on the project to get the job done. What is a Construction Manager (CM)? A CM will be hired by the business owner through a process of evaluating experience and credentials. A CM is going to work based off predetermined fee, and a CMs fee will not change if a project goes over the projected cost or finishes early. Since a CM doesn’t need a design to craft a bid, they can be involved in the pre-design process and ensure the project is built out in accordance to the initial design. Because the CM isn’t “bidding” on a project, they are hired by the business owner because of their background and qualifications. A CM isn’t going to be directly involved on the job site. Instead, they act as a project manager and oversee the entire construction process as a whole. While a CM is typically going to be one person, there are cases where a group of individuals will work together as one entity, typically involving a group of estimators, project managers and accountants. Whether you need a CM on a project is completely dependent on the project itself. In many cases when you’re working with a trusted partner, the GC can take on any important roles the CM would take. In some large projects, you will want a trusted CM to ensure the designs and plan for your project and being carried out correctly. It all depends on the size of your project and your individual needs. Want to discuss an upcoming project with our team? At Green Heart Enterprises, we have an extensive project management team and seasoned general contractors that specialize in commercial construction and renovation projects. Contact us to tell us about your project to see if we can help today. The Delta Air Lines Star Awards is a prestigious recognition for the top performing small and diverse-owned supplier partners who demonstrate excellence in business operations and service to Delta. The Corporate Real Estate Supplier of the Year demonstrates supplier excellence in cost reductions/savings, quality and reliability, innovation, delivery, relationship management, and community outreach. In the past we've participated in a benefit for the American Heart Association sponsored by Delta. The event is a sporting clays, shooting competition and takes place at Fox Hall in Douglasville, GA. We sponsored 2 teams, our teams did not win the event but we had a blast! And more importantly, they raised somewhere around $70k for the AHA. Check out the group and our award below! A while back we got a chance to work with Alaska Airlines. After renovating their Ticket Counter and Kiosk Check-In area at the airport here in Atlanta, we took a few snaps. We think it looks great! 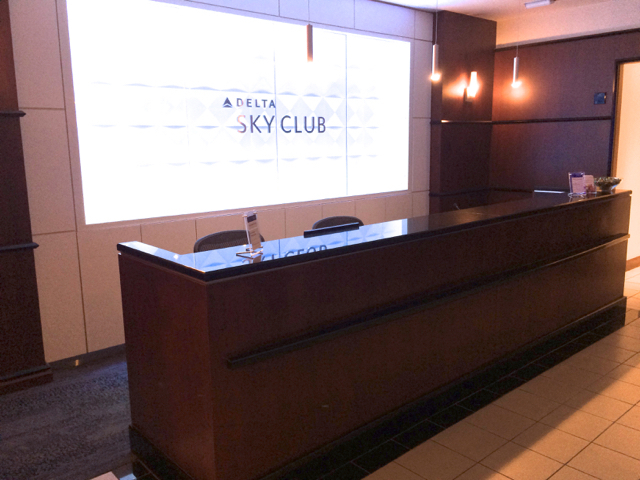 If you need a place to kick back and have a snack or a beverage before your next flight, we can vouch for the Delta Sky Club at Gate D12. How do we know? Well we've spent a good amount of time there over the past few weeks building their "Greet wall"! It's the sleek and welcoming wall behind the greeting desk, hence the name Greet Wall. Check out the pictures below for some during and completed shots.